The UAE is among of the world's safest countries in being protected from terrorism, reinforcing the country's status as a safe haven not just regionally but globally, according to the 2017 Global Terrorism Index (GTI) report. Rated 115 out of 134 countries, the UAE was ahead of some of the world's most developed Western countries including Australia, Belgium, Denmark, Canada, Germany, Finland, Japan, New Zealand, South Korea, Sweden, Switzerland, the UK and the US, among others. 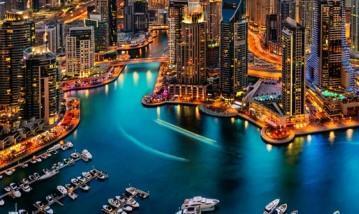 In the Mena region, the UAE was rated among the safest countries along with Morocco and Qatar. Regionally, Bahrain was rated 55, Kuwait 50 and Saudi Arabia 26, says the GTI report, released by the Institute for Economics and Peace on Wednesday. Earlier this year, the World Economic Forum (WEF) rated the UAE as the second safest country in the world, only behind Finland. "It is also one of the most secure destinations (at second place), and has a well-developed hospitality and entertainment infrastructure (27th)," WEF said. The US was ranked 32nd as it witnessed increased terrorist activity over the last few years. "The United States has experienced the majority of terrorist activity in the region (North America) and since 2002, accounts for 89 per cent of attacks and 95 per cent of the fatalities. Since 2014, there has been a dramatic increase in terror attacks on religious figures and institutions, which combined accounts for the highest number of attacks as a target type in 2016. North America is also the only region in which terrorist activity against abortion clinics have been carried, accounting for over ten per cent of the total number of attacks," the report said. According to GTI 2017, deaths caused by terrorism decreased by 13 per cent from 2015 to 2016. There were 25,673 deaths in 2016. This is the second consecutive year that the number of deaths from terrorism have decreased. Deaths have now fallen by 22 per cent since the peak in 2014. European countries and other developed nations continued to record a negative trend, with Daesh's activities the primary driver. Excluding the September 11 attacks, 2016 was the deadliest year for terrorism in OECD countries since 1988. Iraq was the worst hit, getting the lowest rating followed by Afghanistan, Nigeria, Syria, Pakistan, Yemen, Somalia, India, Turkey and Libya made up the top-10 worst hit countries by terrorism, revealed the GTI report. The top 10 countries getting the best, or safest, rating are Belarus, Bhutan, Bolivia, Cambodia, Croatia, Guinea-Bissau, Jamaica, Montenegro, Serbia, and Uzbekistan.